, an English, physician, was born at York, Jan. 22, 1736, and, after having gone through a course of classical and medical education, set up as an apothecary in his native city, in 1760. In 1774, however, he relinquished this branch of practice, in order to apply himself more closely to the study of medical science; and for this purpose he went to Edinburgh, where he graduated in 1778. 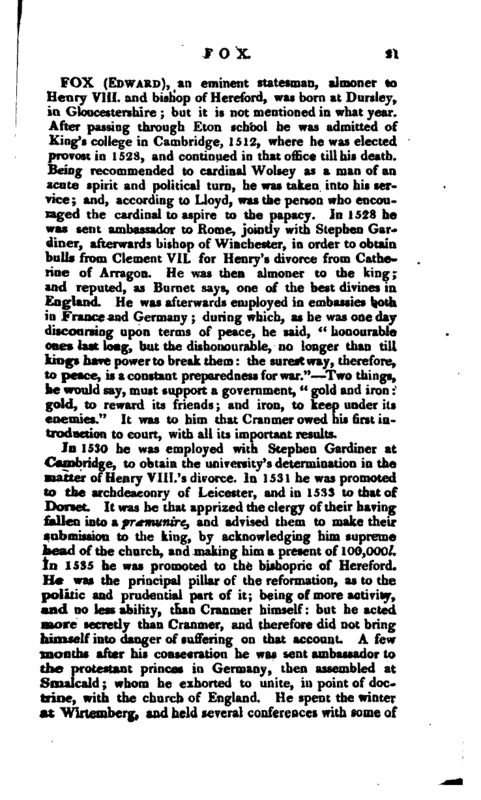 He then settled at Stafford, and was soon after elected physician to the infirmary at that place, where he practised with considerable reputation and success until 1791, when he returned to York. Here he met with the most flattering encouragement; but his ardent attention to his professional duties and studies was considerably interrupted in July 1793, by an attack of a painful anomalous disease of the chest, which he described as “fits of spasmodic asthma, attended with most of the painful | symptoms of the angina pectoris.” After consulting many eminent physicians, and trying a variety of medicines, with partial and transient relief, for two years, he was agreeably surprised by a spontaneous and gradual decline of the symptoms, and was at length totally free from them. 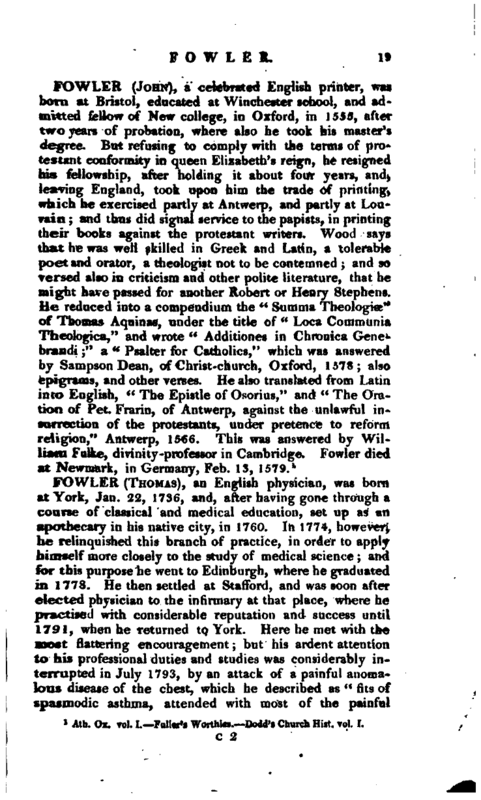 Notwithstanding the check to his exertions which he received from this complaint, his professional emoluments and reputation continued to increase; and m 1796 he was appointed, without solicitation, and even without his knowledge, physician to the lunatic asylum, near York, called the “Retreat,” established by the society of quakers, for the relief of the insane members of their community. He was a member of the medical societies of Edinburgh, of the medical society of London, and of the Bristol medical society. 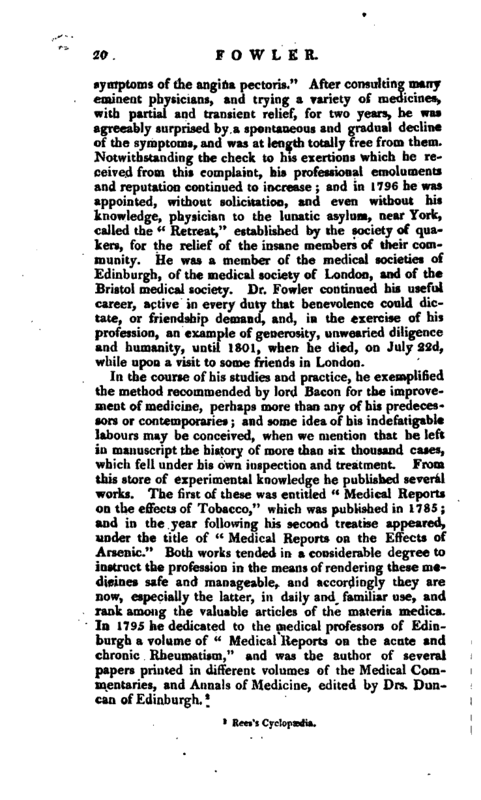 Dr. Fowler continued his useful career, active in every duty that benevolence could dictate, or friendship demand, and, in the exercise of his profession, an example of generosity, unwearied diligence and humanity, until 1901, when he died, on July 22d, while upon a visit to some friends in London.